Comfortable, modern rooms with cable TV, in-room phones, high-speed Wi-Fi, room-controlled heat, air conditioning, small refrigerators, coffee makers, hair dryers, and private baths. For more information on our Motel Rooms, Inn Rooms, and Extra Rooms, please go to our Rooms Page. * Rates are subject to change. Please click here for up-to-date rates and availability. Rooms up to a four-night stay: Cancellations up to 72 hours prior to arrival date will receive a refund of deposit less a 10% fee. Cancellations or no-shows after the 72-hour period will be charged in full. Rooms five nights or more: Cancellations up to four weeks prior to arrival date will receive a refund of deposit less a 10% fee. Cancellations or no-shows after the four-week period will be charged in full..
Any reservation made for Hall of Fame Induction Weekend: Cancellations up to four weeks prior to arrival date will receive a refund of deposit less a 10% fee. Cancellations or no-shows after the four-week period will be charged in full. Rented nightly, these units overlook the lake. Equipped with full kitchens, bath with tub or shower, air conditioning, cable TV, high-speed Wi-Fi, phones, barbeque grills, decks or porches. Sizes range from efficiencies for 2, up to 3 bedroom cottages that will sleep 8 or 10. Basic cookware, dishes, silverware and linens are provided. Please go to our Cottages Page to see links to each cottage, where you will find rate information for that particular cottage. Above rates do not apply to Hall-of-Fame Induction Weekend. Cottages up to a four-night stay: Cancellations up to 72 hours prior to arrival date will receive a refund of deposit less a 10% fee. Cancellations or no-shows after the 72-hour period will be charged in full. Cottages five nights or more: Cancellations up to four weeks prior to arrival date will receive a refund of deposit less a 10% fee. Cancellations or no-shows after the four-week period will be charged in full. To make an online reservation, or to check room availability, or to check on a existing reservation, go to our Book Online Page. Or, if you prefer please give us a call anytime at 607-547-2371. 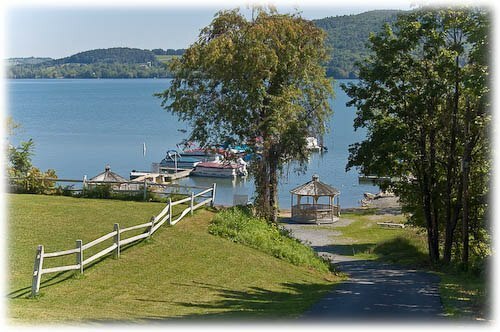 Or, you can send us an email at info@baysidecooperstown.com to check if the type of room or the size of cottage you want is available. Feel free to review our Rates before calling or booking a room online. And make sure to look over Our Policies before booking a room or cottage.